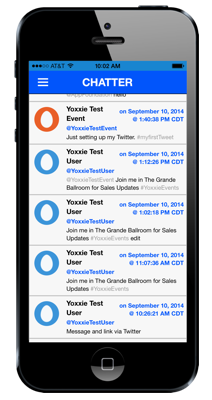 The Yoxxie Mobile Engagement Platform provides multiple ways of integrating with Twitter for an event, and for your attendees, exhibitors, and sponsors. The Chatter feature within the mobile application allows you to associate your event’s mobile application with an existing Twitter account feed. The Yoxxie Mobile Engagement Platform will work with Twitter in real-time to provide up-to-date feed information, and uses advanced data caching techniques to prevent your account from exceeding Twitter API usage limits. The result is that your event’s attendees get up-to-date Twitter information in a timely manner. The Yoxxie mobile application allows attendees, speakers, sponsors, and exhibitors to also define their own Twitter settings. By specifying their Twitter handle, they provide another avenue through engagement via Twitter. Every interaction over Twitter further promotes your event in the social media space. Sign up for your newsletter today, we want to hear from you.